I returned to the area of last years devastating fire here at Tahoe. I had passed by several times since the fire and was amazed at how many houses were being rebuilt in place of those lost, and how quickly they grew out of the ashes. Nature was also busy mending and rebuilding the forest. First to arrive is the amazing Jewel Beetle that can sense a fire from 50 miles away. Not surprisingly, with this capacity, jewel beetles are the first creatures to move into such an inhospitable environment. Because they are the first arrivals, there are no jewel beetle predators to worry about and they can proliferate in large numbers. The female flies to the still smoldering bark of a tree to lay her eggs. By the beginning of summer the wildflowers were abundantly popping up from the ash. And what loves wildflowers? Hummingbirds! That’s what got me excited as a birding friend told me of a spot where probably 50 rufus hummers were feeding on the thistle! Off I went, camera in tow, to observe and photograph a very unusual display of nature at it’s best. As I made my way up the trail I started to see movement in the air. 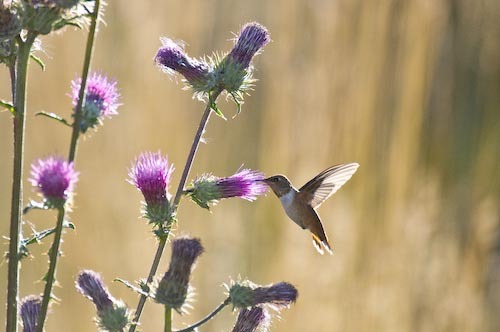 In a few moments I was surrounded by dozens of little hummers darting from one thistle to the next and chasing each other away from their particular blossom. Then two would come together, just a few inches apart, and climb 100 feet into the air. 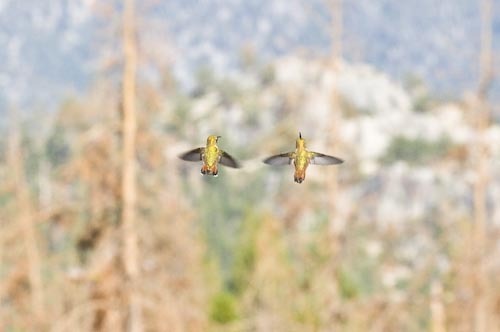 An incredible site I tried to photograph, but they were way too fast to track consistently. I did manage to get this image. I returned several times in the next few days and each time was fantastic. The numbers have dropped now, and I suppose they are starting their migration south. Next year I will do more documentation of the rebirth of the forest after the fire. A giant forest fire broke out, it was so big that all the animals ran to the edge of the forest and watched helpless and in horror as their homes where being destroyed. Except for one little hummingbird. The little hummer flew to the river, picked up a small drop of water, all it could hold in its little beak, and flew to the fire and dropped it on the blaze. Then back to the river for another drop. Relentlessly the hummer took one drop of a water at a time and dropped it on the fire. 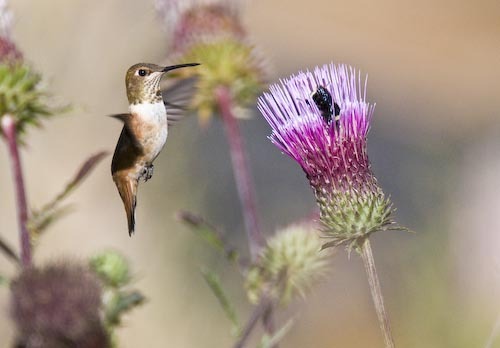 All the other animals stood around telling the hummingbird that it was wasting it’s time. 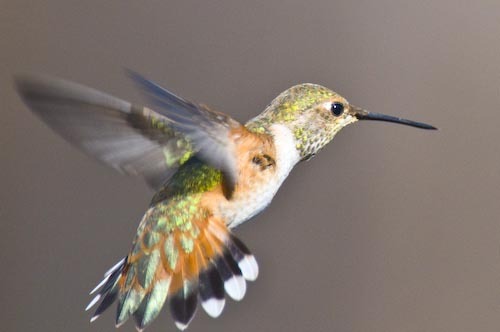 How stupid you are if you think you can make a difference, said the elephant, whose trunk could hold much more water than the tiny hummingbird. What do you think you are doing, said the animals. The best I can, replied the hummingbird.